"Main Titles by From Form"
The last day of Offf Barcelona 2013, was another great line up of speakers starting from 10.30am to 9.30pm. There always seems trends of inspiration and personal messages from each artist. Most were about doing what you love,following your passions to make it work, making mistakes and learning from them, start working on personal projects and experimenting in your downtime when freelancing, as the amount of stories from speakers saying that it caught a major clients eye. 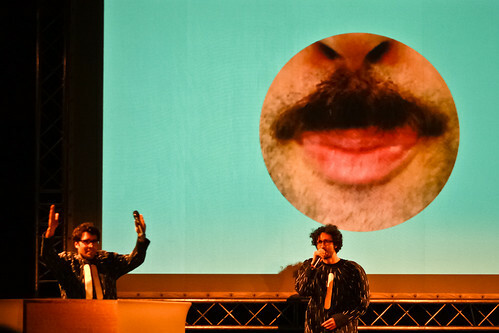 There is so much content to take away from Offf for design inspiration. 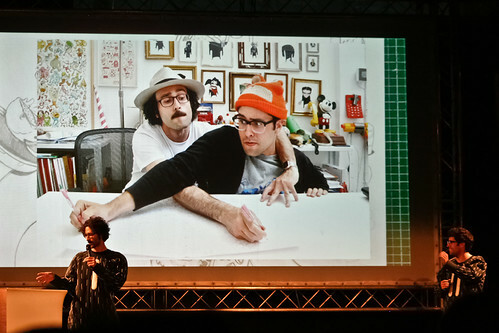 Not just as a conference talk, but as a design event and a peek into Barcelona's creative industry. 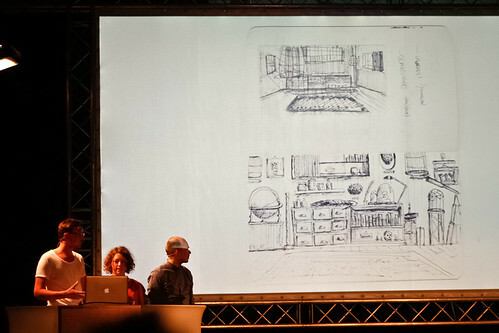 There's boutique design market in the foyer of book shops, artwork from speakers, tshirts, furniture. 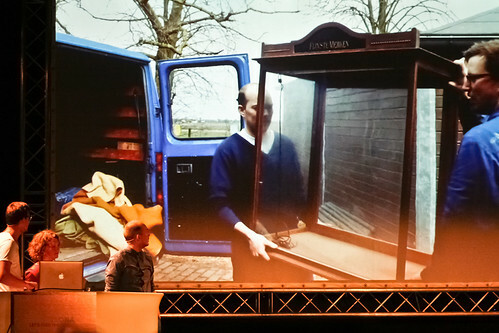 Video management company Nimia set up a super slow mo camera to capture segments of the attendees and speakers. Learning program associated with the festival Atelier offer annual courses and workshops for creating the Offf festival branding and titles etc. There's not enough space to talk about all artists - but check more photos on the last day of other speakers Sarah Blake, Fantasy Interactive, Hydro74, Laura Meseguer and 3D digital artist Rik Oostenbroek. On half of the VJ, projection and installation artist speaking at Offf - New York / living in stockholm artist Sougan talked us through her process of combing all these styles. Her hand drawn illustration skills (getting away from screen overdose) influencing digital media. Starting from a music background working for Ghostly International to the fine arts degree her work is about visualizing music. Learning tones, is like learning karate from the karate kid, repetition. She uses the element of time in her illustrations (the eye following lines) to coding to 3d installations. For projection mapping fiends make sure you check out Mapping festival in Geneve. The well known Argentinian guys from Buenos Aires, talked through two projects - AXN / Criminal Minds and Nickolodean Idents. Instead of talk about it, I'll just show you there awesome work. This humble little studio in Amsterdam is one guy and one girl taking on awesome title design projects. Their popularity started from creating 'the history of the title sequence'. 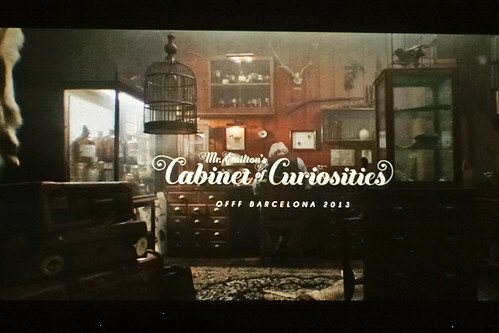 They showed the premiere screening of the main titles for Offf 2013 created by From Form and Part of something. Mr Emilton's Cabinet of Curiosities. An original narrative script to the titles and sound design by Jochin Mader. It was a very lovely 7 mins. Massive applause from the audience - To show the titles for the first time to a live audience then speak about them afterwards takes guts. They dove deep into behind the scenes of their process and crazily enough they made the WHOLE set of the video in their studio, crazy. Picking up old furniture from parents and buying the rest on Ebay - I hope they had a budget for it!I love this kind of dedication to creating great piece of title design.